I was trying to tie something that has a deep hole (around 7 cm). I tried one screw that has stuck in the middle of the hole. I thought that the screw will come to the end but it didn't as its head is wider than the hole diameter. Now the screw's head is stuck in the middle of the hole while its tip is out of the other side of the hole. I can't get it out or push it further to the other side of the hole. This hole is a simple cylinder. Any ideas how can I solve this situation? This thing I'm trying to hang on the wall is so important to me. I would push the screw out the way it went in. 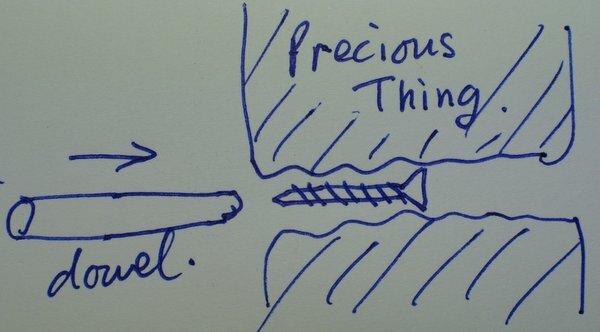 That is I would use something soft like a wooden dowel to push against the point of the screw. It may help to first drill a small pilot hole in the end of the dowel that the point of the screw can go into, then turn the dowel clockwise as you push it in. turning the dowel has a chance to turn the screw and this will help the screw head move out of the hole. Before asking the question here, I asked it in 'crafts and art' Stackexchange website then someone told me it is not the right place so I deleted it and asked here. Before deleting it, someone genius suggested a very simple solution which is to put the plastic thing in very hot water, then it may become easier to push the screw out. I have just tried it and it worked. So simple and yet works. Not the answer you're looking for? Browse other questions tagged screws hanging plastic or ask your own question.